FRG – ARTIST’S RESIDENCY is dedicated to the contemporary art research and production, closely connected with Catanzaro and its cultural heritage and landscapes. The open call is sponsored by Fondazione Rocco Guglielmo in partnership with MARCA - Museum of Arts of Catanzaro, Provincial Administration of Catanzaro and Caravan SetUp. • to connect the local community with the artistic production, encourage participation and restore the creative process. Application provides a residence period of 10 days. 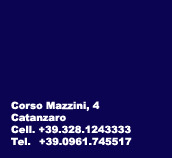 Call is reserved to non-italian artists, who have already exhibited in museums (national, provincial or civic) in context of solo or group exhibitions. Artists can participate as single or collective group. Each artist have to present an unpublished project, designed specifically for the city of Catanzaro, calabrian cultural history or landscapes. For the selection, rewarding criterion will be the involvement of the local companies and / or of the local community. Works must be carried out during the period of residence; they will be realised, installed and opened at the end of residence period. Each artist will have a production budget (€ 1,000.00 / one thousand, 00 euros). Moreover room and board will be guaranteed for each artist. Each artist can present only one proposal. At the end, only 3 artists will be selected. Other external financing is allowed. They must be certified by the co-financier, accompanied by identity card and self-certification of legal representative of the institution. Art works produced will be owned by Rocco Guglielmo Foundation, exhibited in its Collection. All activities will be documented by a catalogue, published by Silvana Editore. The application must be sent by e-mail, not later than 10 May2019, to the following address: residenzedartista.frg@outlook.it. The attachments must be contained in a single compressed folder bearing the artist's name, which must not exceed 1G. All communications will be published on the dedicated area on the website of Fondazione Rocco Guglielmo (www.fondazioneroccoguglielmo.it). Short list will be drawn up and published on the site and also forwarded to the winners by e-mail. For any information, please refer to the email address residenzedartista.frg@outlook.it, specifying in the subject "FAQ - Artist residences announcement FRG 2019".